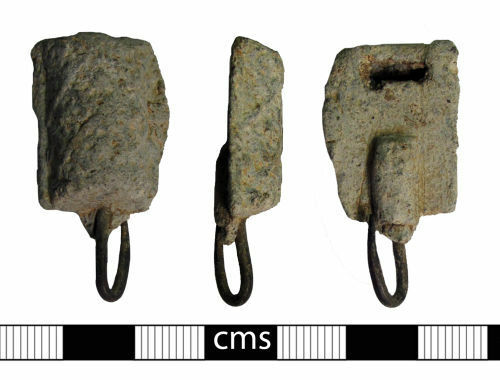 A complete lead alloy hooked clasp dating to the post-medieval period. The clasp is formed from a rectangular body of lead alloy, with a plano-convex sectionand decorated on the curved upper surface with a cross-hatched panel. A single sharp hook of copper alloy protrudes from one short end of the main body, soldered to it by a covering of lead alloy on the reverse of the clasp. There is a small rectangular hole on the reverse and the short outer edge is also hollow, allowing the clasp to be attached to the item of clothing. Similar examples are recorded in Read (2008:53-55) which are catagorised as Class C Type 1. They date to the 16th century AD.